The Sky Raiders are a criminal mercenary group that operates in at least a dozen countries around the globe. They claim to be a legitimate private military company, that provides a wide range of services to legitimate governments, such as conducting reconnaissance and surveillance, initiating clandestine military operations, and training soldiers in special forces techniques. In addition to working for governments, the Sky Raiders are also known to have been in the service of transnational corporations (in particular diamond and oil megacorporations). The Sky Raiders trace their roots directly to one of the United States military’s most prestigious and honorable special forces units, the Joint Command Special Threat Response Battalion. The JCSTRB, nicknamed Vigilance, was established in 1995 as the brain-child of General Aarons, and at the time was the US military’s most advanced response to super-powered threats. The members were cherry-picked from every branch of the United States armed services, and received special training in dealing with extreme risk situations. They were outfitted with cutting edge arms and equipment, and studied with allied super-powered heroes. Although General Aarons was ultimately responsible for the deployment and success of Vigilance, the day-to-day operations were overseen by their field commander, Colonel Virgil Duray. 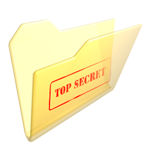 Although many of Duray’s records were classified when he was installed as the commander of the JCSTRB, it is on record that he served his country with distinction for close to two decades as an Army Ranger and then as commander of the elite Vigilance unit. Vigilance’s record was exemplary under Duray, until they were deployed during the Rikti War. In theory, crises like the Rikti invasion were at the foundation of Vigilance’s mission. They weren’t intended to arrest super-powered bank robbers or high-tech carjackers. Unfortunately, no one was prepared for the scope of the Rikti onslaught, and Vigilance suffered terrible loses. The casualty rate was roughly 85% overall, and their super-powered members were wiped out completely. The survivors were demoralized and depressed after the war, but most chose to serve on. 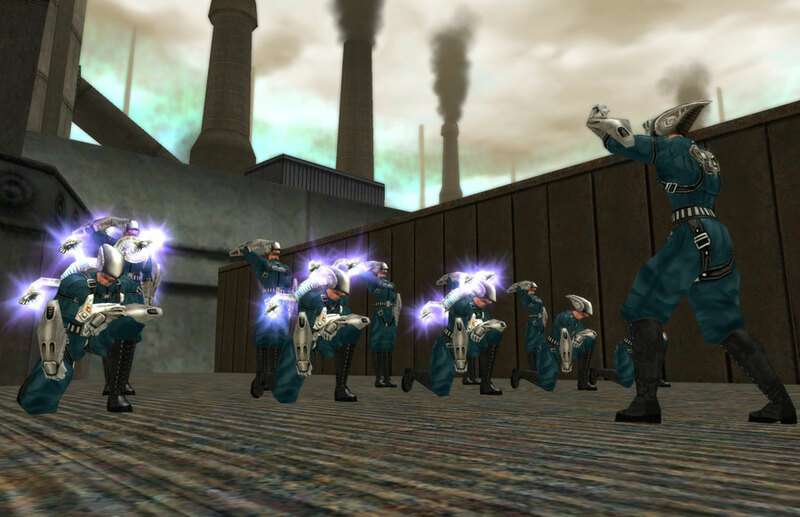 General Aarons re-imagined the team as a rapid response unit, to deal with threats such as the remaining pockets of Rikti. Although Vigilance was heavily reduced in size, the surviving members made up an elite unit of combat veterans who had fought together throughout the war. They completed their re-training and received their orders from General Aarons. However, on the day Duray’s men were to transfer to a new duty station, the unit simply disappeared. The entire unit went AWOL, taking millions of dollars of experimental high-tech weapons systems with them. General Aarons led the charge to find them. Duray was suspected to still be in charge, and presumably retained powerful friends in the military and government who helped hide them. They would not stay hidden long, however, and the Sky Raiders made their presence known shortly, flashing through the sky above Paragon on daring raids. The Sky Raiders’ first few assaults on heroes were deadly affairs. The strike teams used their jet packs and sky skiffs to tremendous effect, blasting high-flying heroes out of the air. For several days the Sky Raiders controlled the air space over Paragon City. Their goals were unclear, but it was confirmed that Duray still led them, and his few public statements crackled with paranoid ramblings and bitter vitriol directed at Paragon’s heroes. No one knew what had turned one of the military’s decorated veterans against the city and her heroes. Duray’s control over the skies would not last long, however. A large Super Group of flying heroes formed to “take back the sky.” They managed to catch the Sky Raiders’ forces spread thin over Paragon, and were able to defeat them before they could coordinate and support each other. With so many of their men arrested, and perhaps worse, the majority of their high-tech equipment confiscated, most assumed the Sky Raiders were wiped out. The Sky Raiders probably would have been a footnote in the history books, except that they had attracted the attention of some mysterious, wealthy backer. A legion of high-priced attorneys got Duray and his top men out on bail. Although the identity of this backer remained obscured, he or she was able to outfit Duray with replacement gear at least as advanced as that which had been lost. With it, Duray broke the rest of his men free, and once again went into hiding. Through the help of their backer, the Sky Raiders were able to replace and upgrade their weapon systems. The Assault Raiders are the basic soldiers of the group, typically armed with submachine guns. Raider Engineers are equipped with prototype force field generators that they can deploy to protect nearby troops. One way in which the Sky Raiders numbers are always replenished are the new Jump Bots – some of the most sophisticated military-grade robots ever produced. These human-sized ceramic and plastic creations resemble a human with extremely thin limbs and torso. Their large, boot-like feet contain powerful jump jets that allow them to leap or fall great distances, hence their name. They are often deployed in combat from Sky Skiffs, hanging onto the skiff and dropping from the sky, using their boots to break their fall. Their arms act as versatile hard points for mounting various weapons. 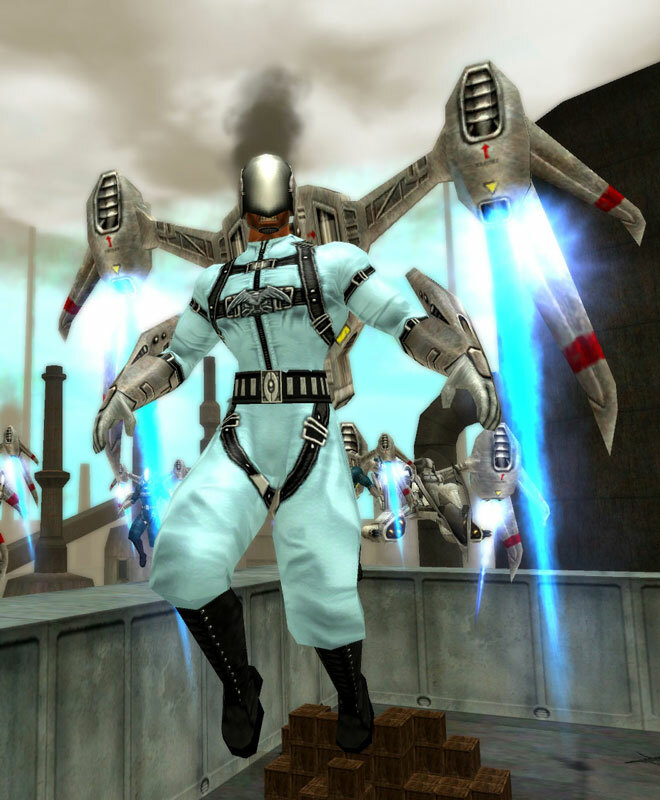 The eponymous Sky Raiders represent the backbone of the mercenary army. Equipped with advanced jet packs that allow them to streak through the sky, they move with tremendous speed and maneuverability. They are often equipped with assault rifles, and nasty machetes for close combat. 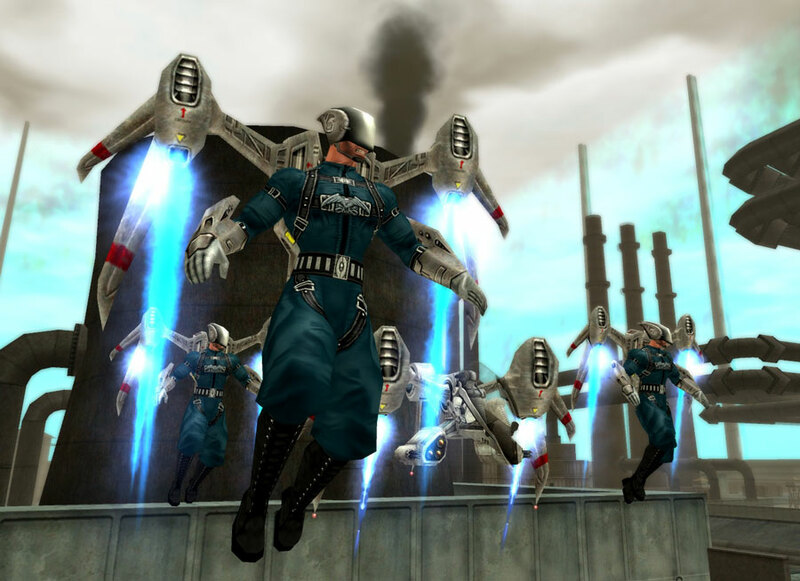 The Sky Raiders are led by Wing Raider Officers. 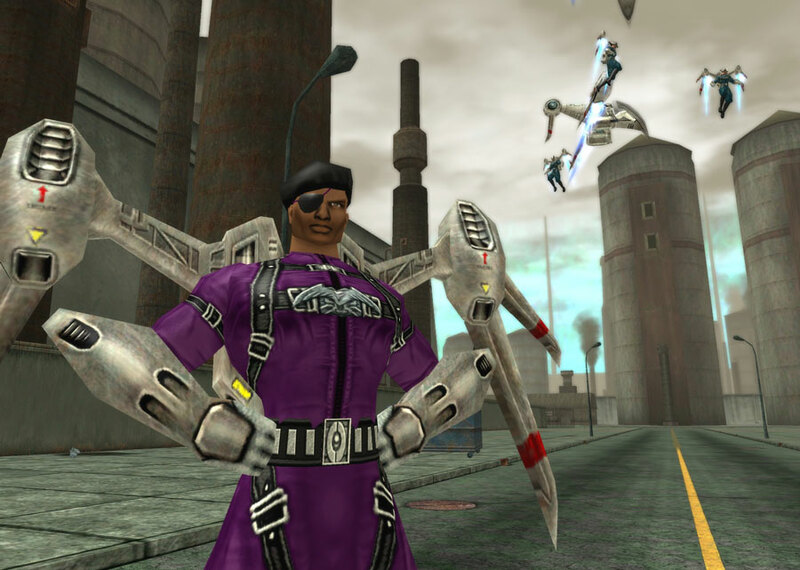 Their mysterious backer has also equipped the Sky Raiders with teleportation technology, believe to have been hacked or stolen from the city’s emergency life support teleportation system. This technology has been incorporated into a wearable weapons system that allows soldiers – Porters – to tap into the energy matrix of the city teleportation net, and essentially teleport at will, as long as he has the exact coordinates of his destination. The suit can also fire bolts of disruptive force from the energy it harnesses. 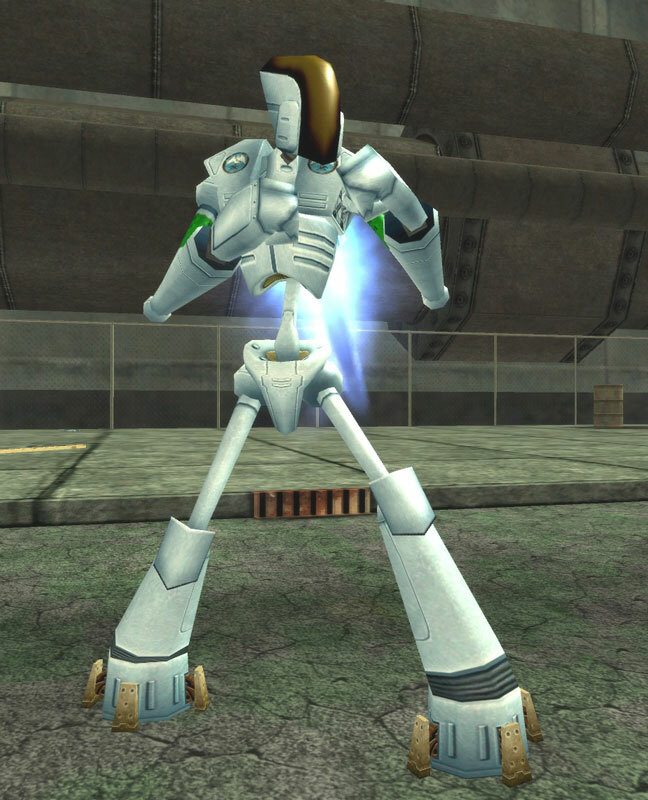 The suits can only be used in Paragon City (or somewhere with an identical teleportation matrix), and accidents with the suits are rumored to be fatal, so the technology is not used frivolously. Once again, the Sky Raiders were a threat to contend with. But they did not limit themselves to Paragon City, or even North America. They began to take on mercenary work around the globe, usually on behalf of some international corporation or a small government having a super-powered problem of some sort. No matter how far a field they stray, however, they always return to roost in Paragon City.